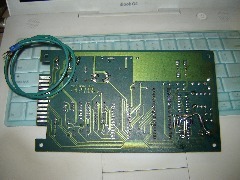 Subject: Modifying Early System 80 MPU boards from two 7461 PROMs to a single 2716 EPROM. Subject: TECH: Recharge those displays! Subject: Gottlieb's Black Hole, some tips..
Subject: Game does not respond to switches, nor are controlled lights running - looks OK otherwise. 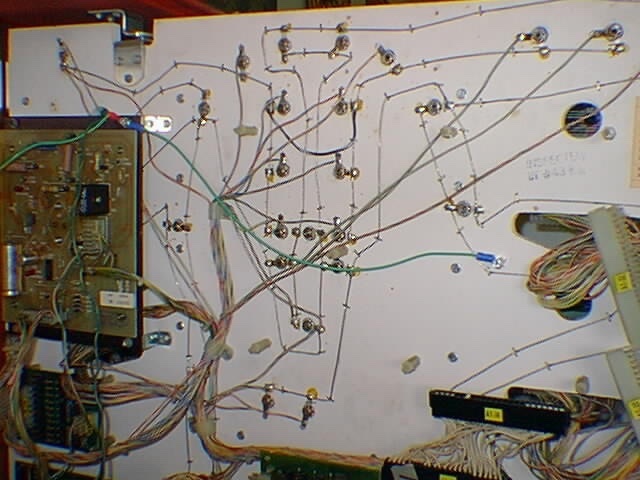 This applied to a "Freddie" System 3 series game, and the problem was an open fuse @ F6 - looked good, but showed open with a meter. (Click on image for blow-up) Gottlieb System 1/80(X) series -Ground Problem areas. "This was the letter that I sent back in 1987 to Mylstar/Premier/Gottlieb, and was published in Replay, & Playmeter outlining my early research and suggested cures for the Ground Problems found in their games. 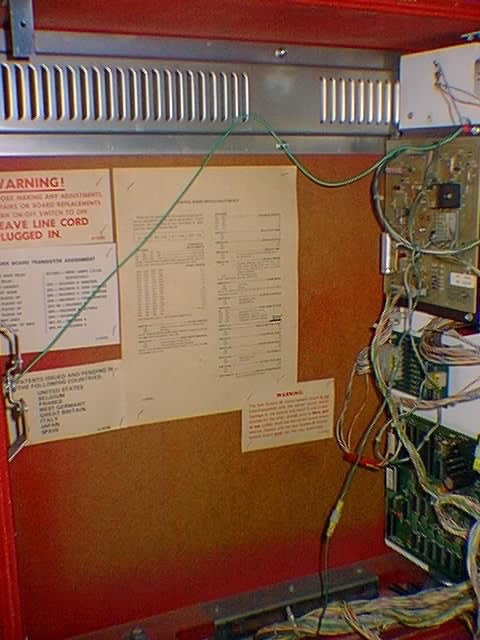 ground wire from the frame to the cabinet ground. This greatly improves the reliability! 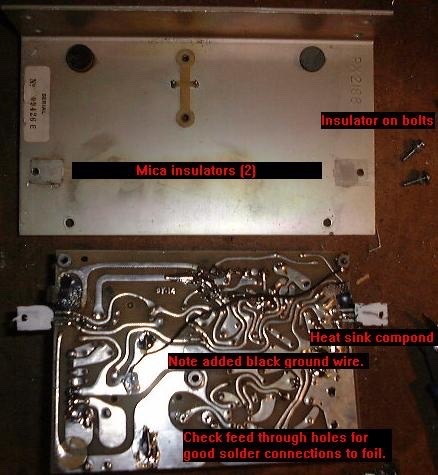 An alternative to disassembling the regulator board is to simply solder on a jumper wire from the negative lead of Capacitor C1 to the metal frame of the regulator (see picture), then run a second jumper wire from the mounting frame to the ground wire soldered to either the headboard lock or speaker. this will vastly improve the grounding of the game and should eliminate the problem of solenoids burning out along with their driver transistors. displays on power-up and lack of game starting or coining up. Here's how to make your displays nice and bright again. used on Sys 80 games, but it SHOULD work on any display). 7-12 seconds (the vertical lines will glow red and become warm). will have to repeat this about once a year. System 1/80/80A/80B - Symptom: Game is turned on and displays immediately come up with "000000", plus the displays flicker in a rolling scroll sideways and the start switch does nothing. 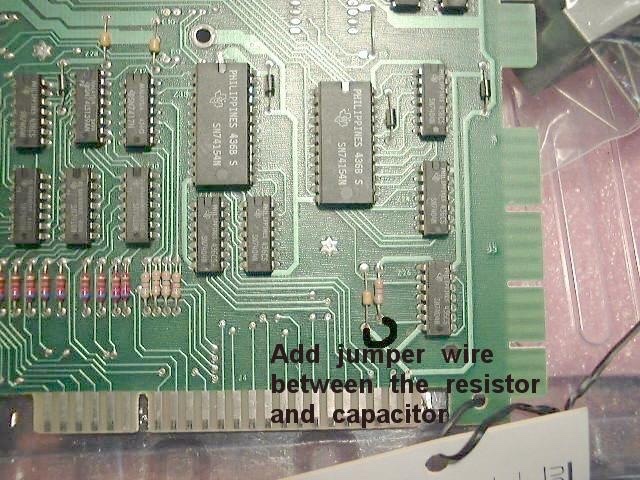 Cure: You have a problem with the SLAM circuit on your game. Either the coin door slam switch, or the ball roll cage switch is open or has a poor connection. 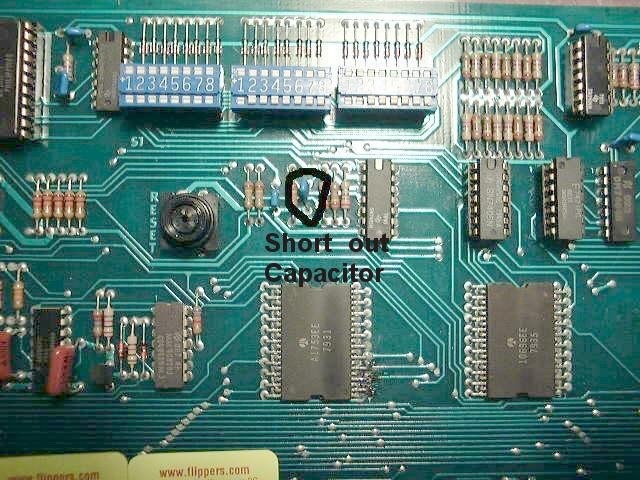 Our recommendation on games of this vintage is to short out the resistor/capacitor on the System 1 MPU or the System 80 MPU to defeat the SLAM function completely. It was only in place to stop people from 'Slamming' the front of the game or dropping the game to get free credits (causes the coin switch to bounce and can thus cheat the operator from the revenue). System 1/80/80A/80B - Symptom: Game is turned on and displays immediately come up with "000000", no flicker and the start switch does nothing. 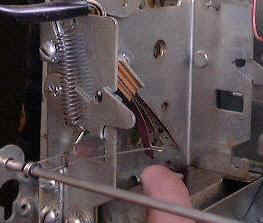 Cure: A common problem for Gottlieb pinballs is that the coin lockout wire gets jammed into the coin switches, see the following pictures for an example. The symptom of this is the game is locked up, displays may come on as soon as the game is turned on, and when the start button is pressed the displays may go blank. 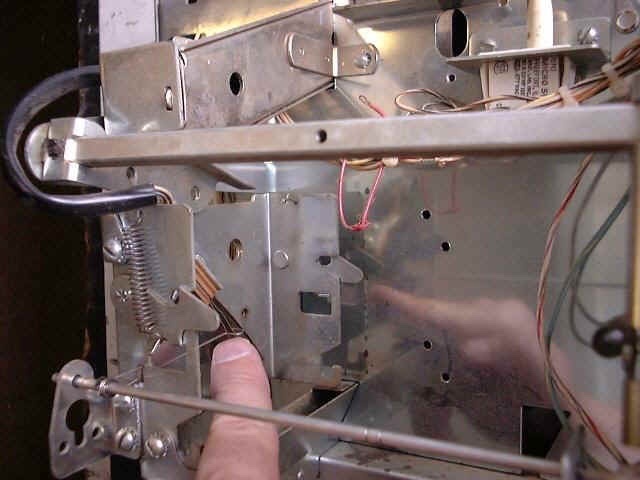 Here is the lockout wire jammed into the coin switch: note that the metal loop is stuck in the blade switch. 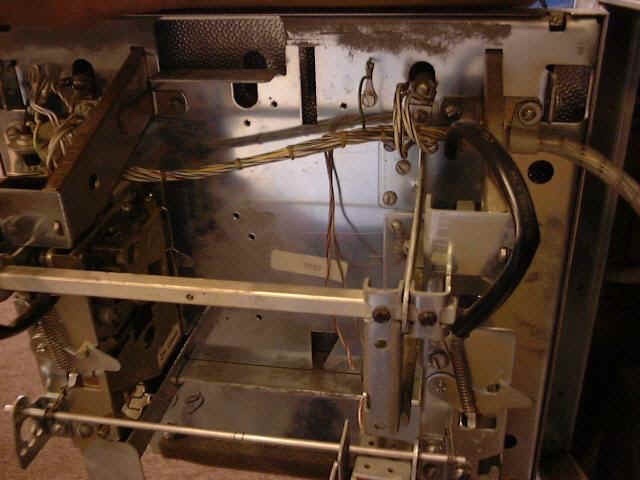 And this is what it should look like (note this door is missing the coin switch actuator wire form): metal loop is free. 1).Cut trace extending to the left from between pins 6 & 7 of IC Z-10. 2.) Jumper IC Z-10 pin 13 to the pad located just below and to the right of IC Z-9 pin 7. 3.) Cut traces leading to PROM socket 1 pins 21 and 19. 4.) Jump PROM socket 1 pin 21 to PROM socket 2 pin 24. 5.) 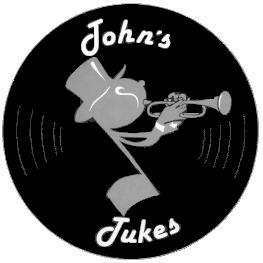 Jump PROM socket 1 pin 22 to PROM socket 2 pin 18. 6.) Jump PROM socket 1 pin 19 to PROM socket 2 pin 21, and you are finished. PROM socket 1 is now wired to accept 2716 EPROMs. Now try it out!. Hope this is clearer now...I'll add some pictures if need be. 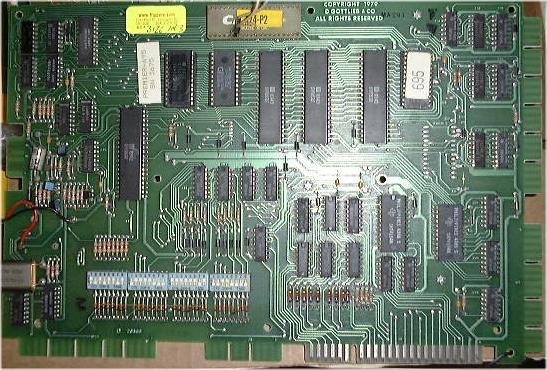 Early System 80 MPU boards have a R/W (Read/Write) timing design flaw (Spiderman, Counterforce, and a few others). These are identified by having TWO PROMs for the Game Memory (often 2 Black plastic ICs) with the GAME number and a '1' or '2' printed on them. James Bond and a few later games might also have this problem as well. 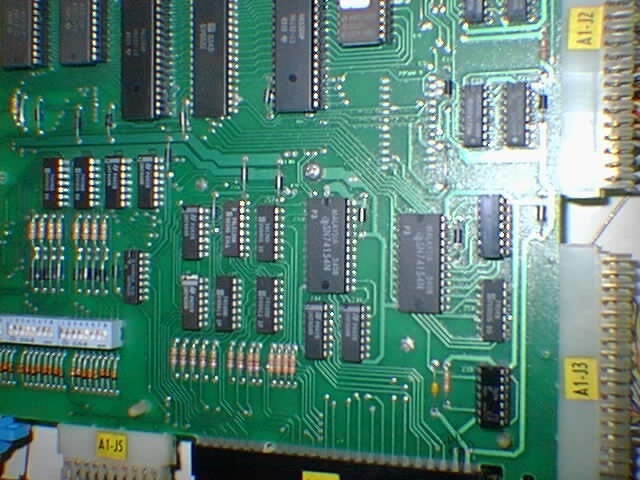 What happened is a timing error was built in to the board for accessing the CMOS RAM (5101) and this prevented the MPU from writing data to the last spot on the CMOS RAM. Now in most cases this doesn't matter at all, but if you are testing the MPU and your test equipment indicates that the CMOS RAM can not be written to at location 1FFFh, or fails when you are sure it is good, then you need to do the following minor change. Solution: Flip the MPU board over after identifying IC Z36 (4069). Cut the trace leading to Z36-10 (Pin Ten of the 4069) on the underside of the MPU and reconnect the trace to Z36-9 (Pin Nine of the 4069). Add a 3K3 pull-up resistor to the underside of the test socket TC1 from pins TC1-11 to TC1-7. This will help stabilize the R/W signal as well. 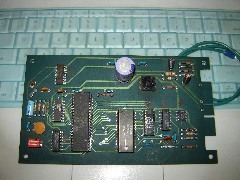 Not required on MPUs that have the RESET board added, as this RESET board has the pull-up resistor already installed. That's all! Now the CMOS R/W timing is correct and you can run the external test fixtures (Fluke 9010 with 6502 pod or the Great Plains System 80/A/B device). System 80 (and System 1) simple 6503 CPU sound boards have a potential problem with input lines that can destroy the 6530 RAM/ROM/IO/Timer IC and these are very rare and expensive to replace. A simple protection circuit that can be added is to tie each of the outputs of the 7404 IC to a 1N400X diode and tie the anode end (banded) of each diode to Vcc (+5VDC) on the sound board. I also recommend adding both a Surge Suppression Diode (1N5908 suggested) and a Ground Wire to the board to further protect it from voltage spikes. 5 X 1N400X diodes are required for this. See pictures below for the positions to add them to. Thunk! Ah, the dreaded THUNK noise that happens often when the game is turned on! Actually the cause is quite simple. Gottlieb, in their wisdom (? ), had Rockwell design the circuit boards for their pinball games and in doing so the "engineers" (must be a Dilbert Zone) neglected to read the recommendation from one of the IC manufacturers. Namely the SN74175N IC's. There is a "Clear" function on these IC's that is used to set the outputs to a known state, and is supposed to be used to make sure the outputs don't turn on in an indeterminate state. Unfortunately Rockwell (or whoever) in their design, decided to simply connect this line to the +5VDC bus. Thus when the game is turned on the outputs are sometimes LOW or sometimes HIGH, and hence the "THUNK". (The following has been updated as of Dec 13, 2013). 1.) For Black Hole you only need to do two of the 74175s - IC Z3 (lower Ball Gate) & Z4 (Lower Hole Kicker, Outhole, Lower Ball Lift Kicker, and Ball Release). Carefully clip the CLEAR leg (pin 1) at the circuit board, bend it up and over the back of the 74175. 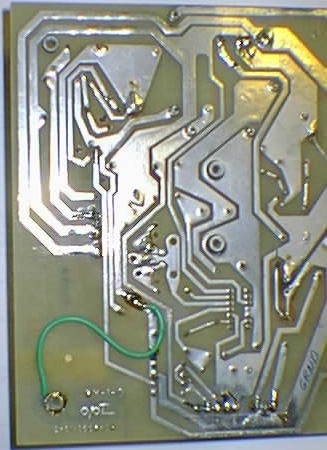 Or on the rear of the PCB isolate pin 1 of Z3 and Z4 (Z5 if you wish too) by cutting the trace and connect the isolated pin 1s together and to the added reset circuit (#3 below). 2.) Next run a small jumper wire between the bent up legs, I recommend that Z3, Z4, and Z5 are done if you aren't sure about your game. 3.) You now need to make a simple RESET circuit for the 74175's. You will require a 10K 1/4w resistor, a 100ufd/10VDC capacitor and a 1N4001 (any 1N4001 - 1N4007 is fine) diode. 4.) Connect one end of the resistor to +5, the other to the + lead on the Cap. The negative lead of the cap goes to ground. 5.) Now hook the diode so the band end of the diode is connected to +5VDC and the other end is connected to the junction of the resistor & capacitor. 6.) Lastly connect the junction of the three (Resistor/Capacitor/Diode) to the line connecting Pin1 of the 74175's. Black Hole version of Thunk Cure. Note: Anti-Thunk mods for specific games - Haunted House used Z4 & Z5, Robo War uses Z1 (L2) and Z4 (L14), while Bad Girls and TX Sector only use Z1 (L2). Hollywood Heat uses Z1 and Z2. If you want to do a generic mod, then simply cut and lift pin one of Z1 through 5 inclusive and tie them all (all the lifted pin 1s) to the reset cap/resistor/diode blob. Done! NO more THUNK. Good work. Oh, and while you are in there, why not do the Ground Fault fixes? 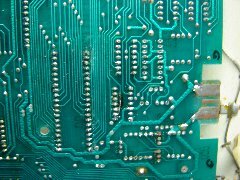 pins on the solenoid/lamp driver board socket A3J3. when the lower playfield relay is energized. Simple, yet effective!